Kristin LidellIt may sound a bit heretical at first but there’ve been genuine problems with Jens Lekman’s visits to Toronto. These aren’t to do with the performances themselves, which have more than ably showcased the droll with and songcraft that have earned the Swedish troubadour legions of fans worldwide, or even a comment on the fact that they’ve been so few and far between, with just three shows in the past seven years. No, the real problem is that despite having no shortage of those aforementioned legions of fans located in Hogtown, he’s always chosen to play rooms that can’t possibly hold them all and while the lucky ones who get tickets are treated to a lovely and intimate evening, many more are left out in the cold (perhaps literally, given his penchant for playing encores out on the street). His March 2005 Wavelength show packed Sneaky Dee’s and when he returned as promised for a show the following Summer, it was at the even-smaller Music Gallery. His return in April 2008 in support of Night Falls On Kortedala was originally supposed to be two nights at the Music Gallery but was condensed into a single night at The Great Hall; better, but still not nearly capable of meeting demand – especially with no less than Owen Pallett opening up. All of which is to say that even though I like the cozy shows as much as anyone, it’s a relief that the Fall tour that he’s just announced to coincide with the September 4 release of his new record I Know What Love Isn’t will be at The Phoenix on October 4. Yeah, it’s a room bigger than the other three he’s played here combined and probably no one’s favourite venue in the city but at least you’ll probably be able to get a ticket. Though don’t take that for granted. Supporting him on this tour is an artist with no small amount of cachet herself, country(wo)man and new labelmate Victoria Bergsmann, aka Taken By Trees, who will have her own new record in Other Worlds to promote. She was last here in February 2010 so you know her own not-inconsiderable fanbase will be itching to get a spot. All of which is to say when the $20 tickets go on sale this morning, don’t dilly-dally. But if you take a few minutes to watch the first video from Love – premiered at Spin and featuring Jens fully embracing his inevitable baldness to say nothing of some “Careless Whisper”-level sax stylings – that’s probably okay. It won’t end well if you don’t hurry to get tickets for Bloc Party’s own return to town on September 10 at The Music Hall. Their own hiatus – which ends with the release of Four on August 21 – hasn’t been so long that their fanbase has diminished much if at all and they were playing much bigger rooms than this before. Tickets are $25 and $35, on sale tomorrow at 10AM. Australian electronic duo The Presets are also back with a new record entitled Pacifica on September 14 and it comes with its own promotional website – youthintrouble.com – and a North American tour that hits the Music Hall on October 23. Sigur Rós takes Filter through the making of Valtari, track-by-track, video-style. They’re at Echo Beach on August 1. Rolling Stone has got a stream of a new song from The Raveonettes’ forthcoming album Observator. It’s out on September 11 and they’re at The Phoenix on October 2. Efterklang have assigned a September 25 release date to their new record Piramida; Exclaim has details and there’s a trailer. Spin talks to Swedish electro-pop duo Icona Pop. The Hives play a studio session for AOL Music and talk turkey with Spin. Daytrotter sessions up with Mystery Jets. Laura Marling chats with The Owl and mentions that album number four is written, currently being recorded, and may well be released before the end of the world year. David ThayerSome artists might take the end of an almost 20-year musical project as an opportunity to withdraw from the public eye and regroup for a bit, but the Lætitia Sadier isn’t like most artists. After the singular Stereolab went on indefinite and probably permanent hiatus in 2009, instead of turning her focus to her long-running side-project Monade, Sadier also put an end to that identity and instead set to work on The Trip, her first true solo record released under her own name in the Fall of 2010. And having established herself outside of either of her former bands, she’s not slowing down a bit. 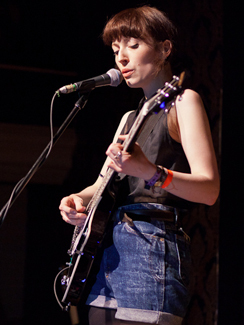 Her second solo record Silencio has been targeted for a July 24 release and she’ll be accompanying it with a full North American tour, which includes a September 18 stop at the Drake Underground in Toronto, a rare opportunity to see her in such an intimate setting – the Drake is a fraction of the size of the rooms that Stereolab used to play. A couple of preview tracks from the new record are available to download; they’re decidedly less synth-infused and arguably more conventional than anything she did with Stereolab, but the voice in unmistakeable. Natasha Khan has released details of the third Bat For Lashes record – it will be entitled The Haunted Man and be out on October 15. Three new songs were captured live and committed to the internet last night; The 405 has the decent-sounding clips. The buzz behind British electro-pop artist Charli XCX was only barely started to pick up steam in North America when I saw her at SXSW in March, but it seems to have picked up considerably more momentum since then. Her debut album is a ways off – it’s looking like October in the UK but not until Spring in North America – but she’s just put out a new mixtape in Heartbreaks & Earthquakes and is getting added to a number of Summer festival bills, including the Justice/M83-headlined Hard Fest at Fort York in Toronto on August 4. So if you were going or thinking about going, there’s a little more on the bill to entice you. There’s interviews with Charli XCX at eMusic and Interview. Mystery Jets have released a new video from their latest effort Radlands. They’re at The Sound Academy on June 19 supporting Keane. Drowned In Sound has a two-part interview with Blood Red Shoes, in town at The Drake on September 26. DIY and Spin interview Orlando Higginbottom, the guy behind Totally Enormous Extinct Dinosaurs, who’ve just announced a date at the Hoxton August 10. Gorilla Vs Bear has details on the new Taken By Trees album; it’s called Other Worlds and will be out October 2. Yes, there’s a trailer. The Raveonettes give Spin the goods on their next record, entitled Observator and due out on September 11. They play The Phoenix on October 2. Aux.tv gets some commentary on the video for “Little Talks” from Of Monsters & Men. The band also plays a Field Recordings video session at Sasquatch for NPR. And if you need a little more Icelandic flavour – don’t we all? – there’s a new Made In Iceland compilation streaming over at Iceland Music Export.